Best of Luck Video Slot Guide & Review - Casino Answers! Best of Luck is a 5-reel, 20-line video slot developed by Rival, featuring wild symbols, scatter symbols, free spins and multiple bonus games. 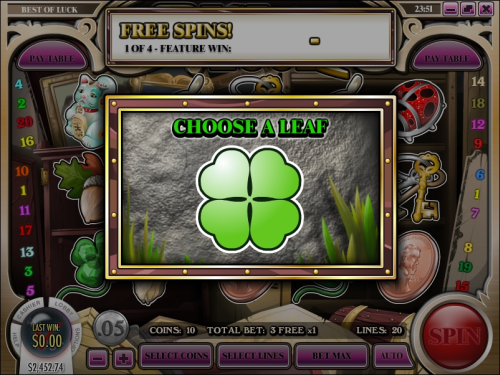 You can play the Best of Luck video slot at Bovada. To win the 10,000 coin top jackpot on the Best of Luck video slot, you must have 5 Kitten symbols appear on an active payline. The Kitten symbol is wild and will substitute for all other symbols in the slot game except for the scatter symbol. Win this top jackpot by playing Best of Luck at Bovada! All wins pay left to right except for scatters, which pay any. Only the highest win is paid per active payline. All wins are multiplied by the coins staked per line except for scatters. 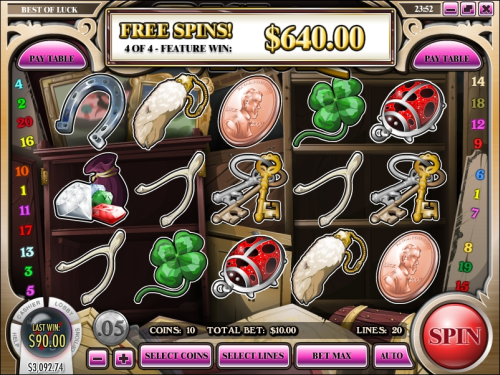 If you’re the type who has to have your rabbit’s foot, lucky penny or other lucky charm on you when you play at an online casino, we think you’ll have a lot of fun playing the Best of Luck slot machine. If you think today’s your lucky day, start playing the Best of Luck video slot now when you sign up and make your first deposit at Cocoa Casino! Are USA players able to play the Best of Luck video slot? Where can I play the Best of Luck Flash game for free? You can play the Best of Luck Flash game for free or real money at Bovada. What is the top jackpot on the Best of Luck slot machine? Best of Luck has a sweet 10,000X top fixed jackpot. To win it, you must hit 5 Kitten Statue symbols on a payline. Where can I play rival flash game slot machines?